Iran blames 'Zionists' for 'inhuman crime'. State news agency says attack was carried out by two suicide bombers. 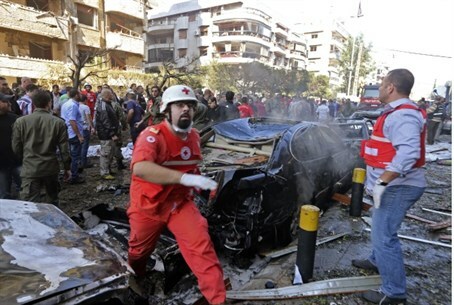 Two deadly blasts took place in quick succession near the Iranian embassy in Beirut on Tuesday morning killing 25 people and leaving 146 injured. Lebanese sources told Al Jazeera that the Iranian ambassador is safe, but the cultural attaché of the embassy, Ebrahim al-Ansari, has been confirmed dead. Iranian sources have said that all other embassy staff are safe. Iranian Ambassador to Lebanon Ghazanfar Rokn Abadi confirmed the death of al-Ansari in the blasts. He told al-Manar television that al-Ansari died from wounds he sustained in the attack. Earlier, he had told Iran's Mehr news agency that all staff who were inside the embassy escaped unharmed. "All colleagues inside the embassy are in full health," he said. “The agents of the Zionist entity Israel are behind the blasts,” he later told al-Mayadeen television. “This terrorist attack will not affect us, but it will make us stronger and more convinced of our stances,” he added. The bombings were "an inhuman crime and spiteful act done by Zionists and their mercenaries," Iran's Foreign Ministry spokeswoman Marzieh Afkham said in remarks carried by the official IRNA news agency. It was not immediately clear what caused the blasts. Reuters news agency reported a security source saying the blasts were caused by two rockets fired on the area, in the southern part of the city. An armed guard of the Iranian embassy told the AP news agency that the first blast was believed to have been carried out by a suicide attacker who rode a motorcycle and blew himself outside the gate. The second, more powerful explosion, was a car bomb, he said. Lebanon's state-run National News Agency said the first blast was caused by a suicide bomber walking down the street, while the second went off moments later when another suspect blew himself up after driving his explosives-rigged vehicle into the area of Bir Hassan. Residents reported a loud blast being heard, while local Lebanese media broadcast live images of smoke billowing from the embassy building. Pictures of wounded people being carried from the scene of the blast were also broadcast. Al Arabiya said some six buildings near the Iranian embassy have been severely damaged and security forces have been deployed heavily at the site. The area around the Iranian embassy, in south Beirut, is considered a Hezbollah stronghold. "People are roaming the streets looking for loved ones," said the reporter. "Ambulances are arriving to the scene, and we understand there are a lot of casualties." There were initial reports that the blasts were caused by a rocket attack. However a security source speaking to Reuters news agency dispelled that theory, saying the cause was a car bomb and denied the reports regarding rockets. Although the motive and responsibility for the blast has yet to be officially declared, this incident is the most likely the latest in a string of attacks linked to the ongoing sectarian war in Syria, which has pitted the Shia-backed government and its supporters against the mostly Sunni rebels. That conflict has inflamed tensions among neighboring Lebanon's delicately-balanced patchwork of religious communities - in particular between Shia and Sunni Muslims - where many families and clans have close ties with relatives in Syria. Iran is a major backer of the Syrian regime of Bashar al-Assad, who hails from the Alawite sect, an offshoot of Shia Islam, and has been supporting government forces financially, logistically and on the battlefield itself. Tehran is also the primary sponsor of the Lebanese Shia terror group Hezbollah, which has sent fighters to Syria to back the government of Bashar al-Assad, and whose military forces inside Lebanon itself are considered to be more powerful than the Lebanese Armed Forces, leading many analysts to term Hezbollah's Lebanese network as "a state within a state". These facts have made Iran and its proxies, in particular Hezbollah, public enemy number one among Sunni Islamists. The blasts come as a long-awaited offensive by Syrian government forces, backed by local and foreign Shia militias (primarily from Lebanon and Iraq) appears to have begun in the strategically-important and largely rebel-held Qalamoun region, near the Lebanese border. Sunni groups had threatened to retaliate against Hezbollah if its forces joined the anti-rebel offensive, which they appear to have done in significant numbers. Tuesday's blast was the third that rocked Beirut's southern suburbs, a Hezbollah stronghold, in five months. Last month, a booby-trapped car was discovered by the army in al-Maamoura area of Beirut's southern suburbs. On August 15, 20 people were killed in a blast in southern Beirut believed to be linked to the spillover into Lebanon from the Syrian conflict. There was disagreement between news sources on the exact number of dead. A month earlier, a car bomb in the same area injured about 50 people. Hezbollah fighters were instrumental in a strategic victory by Syrian government forces in Qusair, close to the border with Lebanon, in early June.